I haven't had a guest poster on the blog in a while but I had an opportunity to have Beth, of yes, folks. i run like a girl talk about her pretty amazing experience running a race on New Year's Eve in Barcelona. If you have even wanted to run through a Spanish city with 10,000 friends on the last day of the year wearing fake noses....read on. 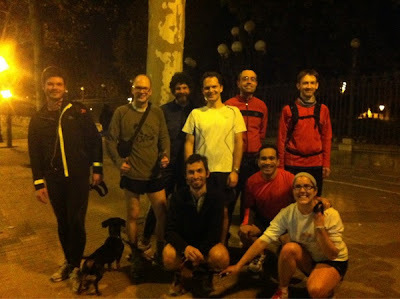 One of my travel “tricks” is to find a local running club and join them for a run or three. Aside from the obvious the benefit of getting a nifty tour of an unfamiliar city, running with locals usually offers insight into the area that goes far beyond what I can read in a guidebook. In Barcelona, I found the Barcelona Casual Road Runners Meetup. Don’t let the name fool you. The only “casual” thing about the group was their attitude toward newcomers. The runners were very welcoming, but they kept up a brisk pace! Before the run began, we chatted and warmed up. 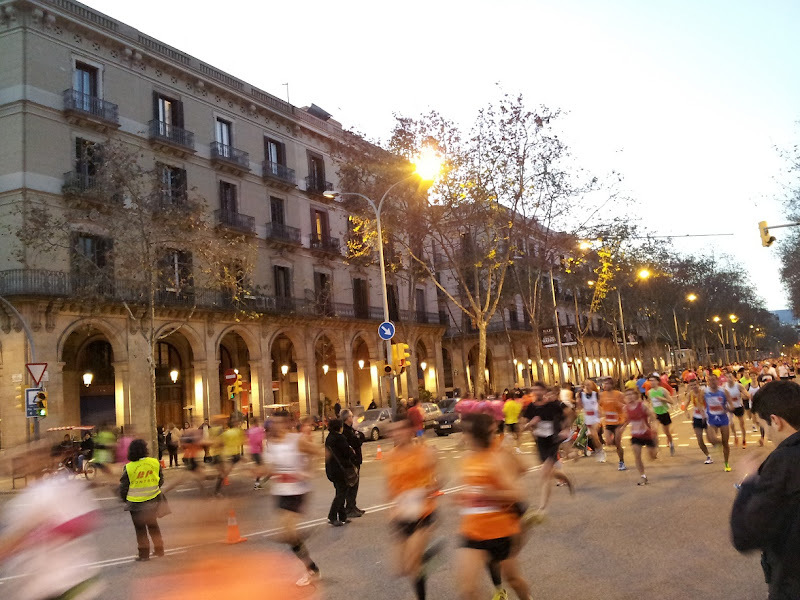 One runner gave me insights into Catalan holiday traditions. Another runner fed me information on great Barcelona restaurants. In fact, one of the best meals of the trip was at the running-group-recommended La Llavor dels Origens, an organic/local restaurant featuring traditional Catalan dishes. The spinach cannelloni and baked-stuffed onion were incredible. 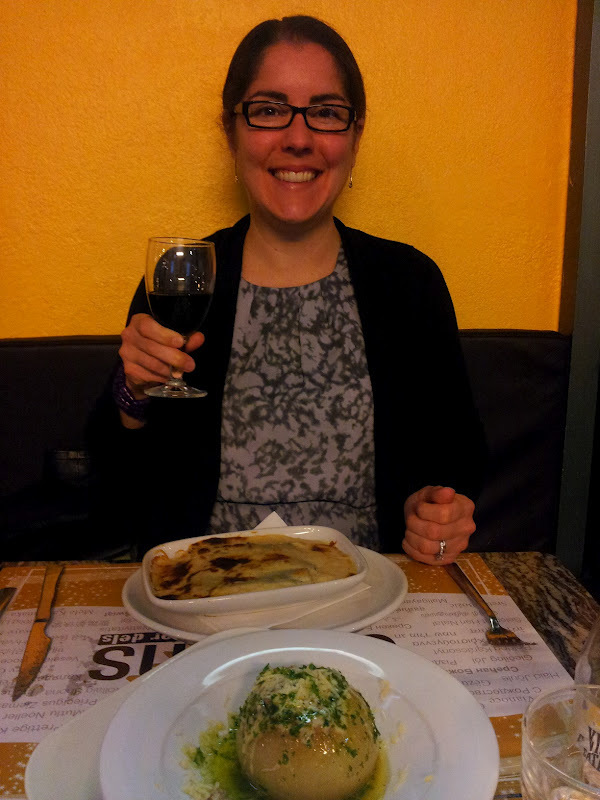 (And it didn’t hurt that the restaurant served a complimentary shot of muscatel wine at the end of the meal.) Calling Origens one of the best meals of the trip is saying something, too, as the food was delicious. 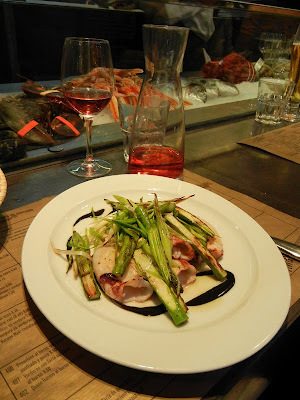 Dishes were fresh and flavorful in nearly every restaurant and tapas bar we tried (especially those that were inside the fresh markets). Yes, I suppose I could have learned about the bizarre Catalan joke about noses, the 10k, and the New Year’s grape-gobbling by Googling it, but what’s the fun in that? Thanks Beth! So fun to read about adventures running around the world. Do you go running while on vacation? Yes! I don't work out as much while on vacation but I try to include some runs to keep up fitness even while on holiday. Have you ever run in a foreign country? In Hong Kong obviously I ran, and also in Germany. I think that may be it? Peter Sagal (of Wait, Wait, Don't Tell Me fame) always runs with a local club in the city he is traveling to! I love running in new places. Really enjoyed this post! Thanks for having Beth as your guest. this is so awesome - you had me at "baked stuffed onion" -> need this!!! I can't believe they do all that and run through the city. What is the big nose symbolic of?!? haha thanks!!! I really enjoyed this post and it will be one that I will have to share with Allan! this is so cool! i love running on vacation...i think its so fun to run in new places! I love this. Combining running with traveling is just the best, especially when you get involved with a local tradition like that. My favorite experience like that was running a 35k "bush run" in Australia last year. Awesome! hooking up with a local running club is such a great way to see a new place! Artículo muy interesante, visitaremos su sitio web más a menudo. Podéis visitar nuestro sitio web http://deporteysalud.eu/ , es un blog de deporte y salud donde estamos tratando de informar a los usuarios sobre curiosidades y información relevante.